Autumn Borts-Medlock is one of the great young innovative potters of the Santa Clara Pueblo. Her renown family includes Sister Tammy Garcia, Mother Linda Cain, Grandmother Mary Cain and Great-Grandmother Christina Naranjo. 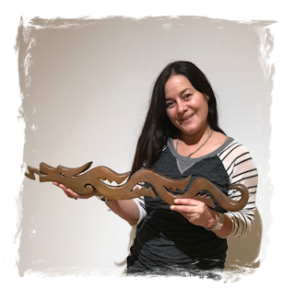 Autumn has said of her work; Growing up in Santa Clara Pueblo, in a family whose connection to the clay goes back generations, pottery has always been a part of my life. I was introduced to the art form as a child, making my first formal attempts at clay work under the guidance of my mother and grandmother. Working exclusively in the ancient traditional Pueblo technique of coil-building, they shaped bowls, vases, and plates from clay they had gathered from the hillsides near the village and processed themselves. Nearby, I sculpted animal figurines and nativity scenes from the moist clay, always welcoming the gentle hands that occasionally reached down to direct or redirect my efforts. These lessons solidified my connection to the clay and gave me the skills I needed to move into coil work. Within a few years, I was working alongside my mother and grandmother, making pottery from clay that I was now helping to gather and process. Drawing from the spiritual symbolism and nature-oriented design aesthetics of Tewa culture, we carved the shapes of kiva steps, bear paws, feathers, rain clouds, water serpents and lightning bolts into the surface of the vessels and used smooth stones to polish them to a shiny, mirror-like finish. We waited for a calm, wind-free morning to fire them outdoors in flames kindled by thin, fragrant sticks of red cedar, watching the timing down to the second in hopes of keeping our long-labored creations from succumbing to this always-risky phase of the pottery-making process. 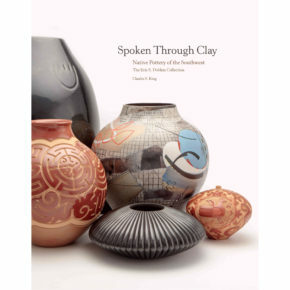 Learning directly from these two extraordinary artists was indeed a gift, and they remain among my strongest influences even now.” Autumn has won numerous awards for her pottery at Santa Fe Indian Market, and her work is in the permanent collections of museums such as the Denver Art Museum and the Heard Museum. 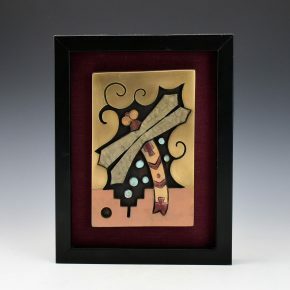 Her pottery continues to charm and intrigue with her distinctive and intricately designed imagery. This is an intricately carved canteen by Autumn Borts-Medlock. 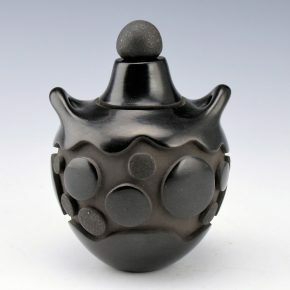 She is known for her often fanciful carved pottery and use of unique shapes. The canteen is built with two handles. It is fully carved with a series of circles which flow around the piece. They are either polished or slipped with mica. There is also a micaceous lid which fits onto the top of the piece as well. The piece is in excellent condition with no chips, cracks, restoration or repair. It is signed on the bottom in the clay, “Autumn Borts”. This is a extraordinary piece by Autumn Borts-Medlock and her mother, Linda Cain. Over the years they have created some extraordinary collaborative pieces. This jar has a carved elk skull which is deeply carved, etched and highlighted with a white clay slip on the front of the piece. The antlers of the elk are also carved and polished red. In the center of the skull is a large inset piece of turquoise. 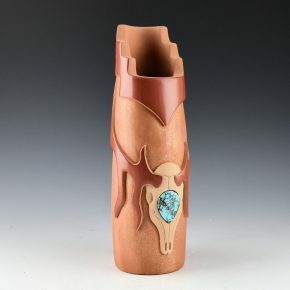 As the jar is turned, the antlers extend to the back and there are two crossed arrows with a single inset piece of turquoise. The area surrounding the carved surfaces has a micaceous clay slip. The use of the mica is a perfect contrast to the polished surfaces. 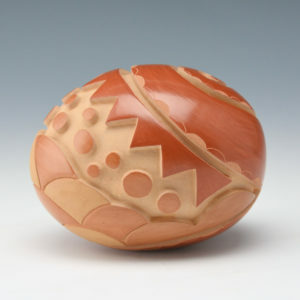 The top of the jar is carved with a kiva step pattern. The scale of the jar along with the complexity of the carving make this a exceptional piece of their art. Autumn is a sister of noted potter Tammy Garcia. Both Autumn and Linda have won numerous awards for their pottery, recognizing their creative and contemporary style of carving. Autumn Borts-Medlock is known for her creative carved pottery. As well, she has created some dynamic pieces in bronze over the past few years. This bronze is entitled, “Pueblo Parrot”. It is stylized in much like the thick-billed parrot, which was actually native to the New Mexico area in the past. It also has a connection to the Ancestral Puebloan bird figures created at places such as Chaco Canyon. 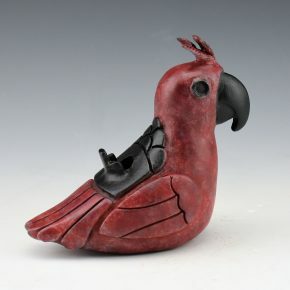 The bird is carved with a feather pattern and on its back is a cloud and mountain design. Autumn says she was inspired to create her parrots after a two-day excursion to Chaco Canyon. This piece is number 10 of 50. The colorful patinas give the piece a striking appearance. It is signed and numbered on the bottom. Autumn Borts-Medlock is known for her creative carved pottery. As well, she has created some dynamic pieces in bronze over the past few years. This bronze is entitled, “Raincloud Dragonfly”. It is made in the style of her clay tiles. The imagery is deeply carved into the clay before it is turned into a bronze. This piece has a dragonfly in the center and it is surrounded by cloud patterns. The representation is both to the importance of water as well as the dragonfly being seen a prayer messenger. The dragonfly on this piece has a red patina and there are blue for the water. The piece is number 10 of 65 on the side. It is signed and numbered on the bottom. The bronze is mounted and framed. 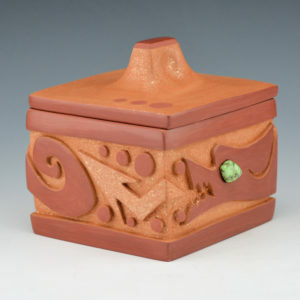 Autumn Borts-Medlock is known for her creative carved pottery. As well, she has created some dynamic pieces in bronze over the past few years. This bronze is entitled, “Cosmic Dragonfly”. It is made in the style of her clay tiles. The imagery is deeply carved into the clay before it is turned into a bronze. This piece has a dragonfly int he center with a talking bear paw to the side. The circles represent the planets and the cosmic connection between the heavens and the earth. The turquoise colored patina is used on the dragonfly. The piece is number 8 of 65 on the side. It is signed and numbered on the bottom. The bronze is mounted and framed. 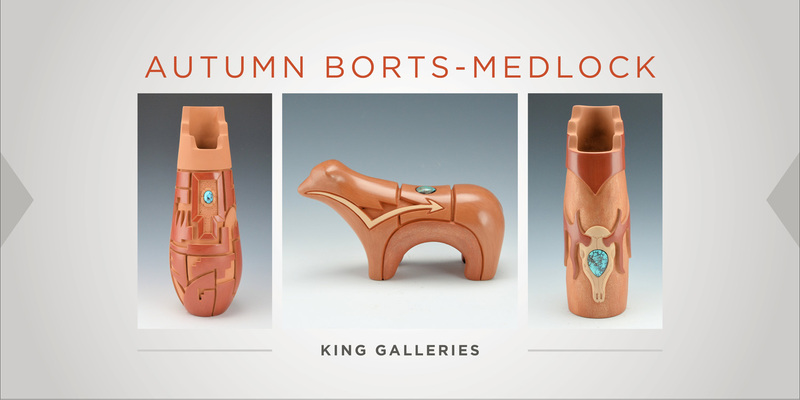 Autumn Borts-Medlock is known for her often fanciful carved pottery. 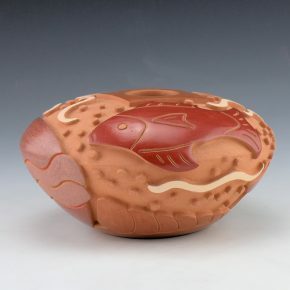 This bowl is carved with two fish as the central design. Separating the two fish is a clam shell. The fish are polished red while the clam is tan polished and there is a micaceous mauve colored clay. The top has little round carved circles which are the “air bubbles” and there are also white areas which are the movement of waves. 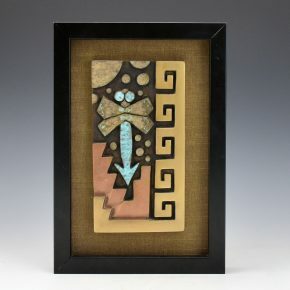 The piece is a striking use of carving and clay colorations to create a complex design. The seedpot is from 2002 and it is in excellent condition with no chips, cracks, restoration or repair. Autumn Borts-Medlock is known for her often fanciful carved pottery and use of unique shapes. This seedpot is oval in shape. It is fully carved with cloud pattern on one end. The clouds are polished tan and matte. Above the clouds are circular rain drops and a triangular sun pattern. As the seedpot is turned there is a galaxy style swirling behind the rays of the sun. The bottom has an additional swirl of clouds. Note the depth of the carving and the various shapes and use of different clay slips. Exceptional! It is signed on the bottom in the clay. Autumn Borts-Medlock is known for her often fanciful carved pottery and use of unique shapes. The boxes are inspired by the traditional corn meal boxes which were used ceremonially. Today, few potters consider making boxes, as they are technically so difficult. This box is very traditional with a water serpent encircling the piece. The avanyu is fully polished and the tongue is slipped with a micaceous clay. The lid is micaceous with a polished top. The eye of the avanyu is a single piece of Damale Turquoise inset on the back. It is signed on the bottom in the clay. It is striking use of traditional designs and form.